Whisk together lime juice, oil, cumin and garlic powder in medium bowl. Add turkey; toss to coat. Layer tortilla chips on bottom of large 12- to 14-inch round or oval baking dish. Evenly spoon beans over chips. Top with turkey; sprinkle with 1 cup cheese. Layer remaining tortilla chips. Spoon 1 cup salsa evenly over chips. Top with remaining 1 cup cheese. 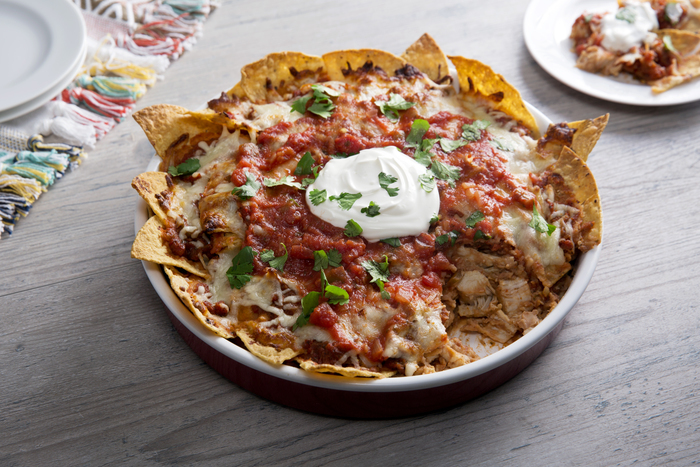 Bake nachos 15 to 20 minutes or until heated through and cheese melts and begins to bubble. Serve hot with remaining 1 cup salsa. Top with sour cream and cilantro, if desired.